AnyMP4 iPod Video Converter is the superb video converter for iPod users, which can not only help you convert various video files and even HD videos to iPod compatible video formats like MP4, MOV, M4V and MPEG4 with fast speed, but also you are able to extract M4B, AUD, MKA, AIFC, CAF, MPC, QCP to iPod audio and output AAC, AIFF, MP3, WAV, etc. 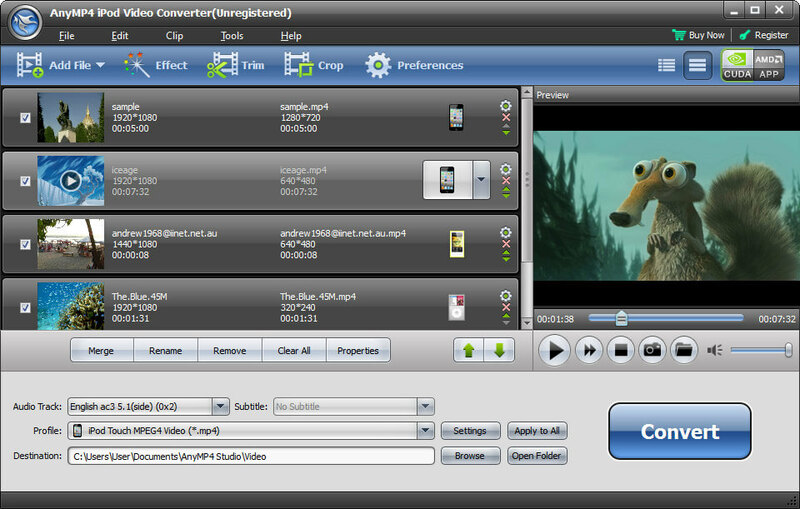 Moreover, the iPod Video Converter owns some powerful editing features that allow you to customize the video effect. So you can add picture or text watermark to the video, trim your needed video/audio length, crop the video frame and adjust video/audio profiles. In addition, it supports the latest iOS 7 and iPhone 5S/5C.